Available now - only $4.99 and available for immediate purchase, delivered as PDF same day. Click on the image to the left to purchase. Available now for free download - just click on the cover image to the left. Only you can make the call on how and when to proceed doing your next or first path to project management directions in your career. Is the time right now? Next year? Are you looking for more responsibility – or just tired of what you're doing. Both are good reasons to change – though I'd take the former over the latter because jumping into a PM career is no small step, it certainly isn't easy and it is not without it's on immense challenges and responsibilities. Available now free - just click on the cover image to download. 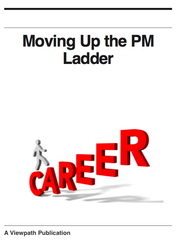 Whether you are looking to become a project manager, currently are a project manager and interested in moving your PM career along or to another organization, or are interested in taking the next step into upper-level management in yours or another organization, this eBook should be of some value to you. Creative Project Stakeholders - Who, What, and Why? Available for free download. Click on the cover image to the left to go to the download page for this eBook. is complete. But they are out there. And you have to make room for them — they are very important to the creative project. It would be nice if money weren’t an issue. It can get in the way of our creative juices. And we can’t continue to operate very long if we are not profitable. We may lose money on any given project, and that’s OK as long as our organization is sustainable and it gives us a strategic advantage. But long term, we need to make money to survive. Therefore, paying attention to the bottom line as we manage the creative process is critical. Our project client is of utmost importance. Whether that is an internal business unit utilizing our creative team for a product release or ad campaign, or an external client who has tasked us with helping them roll out their next project, our client is critical. I’m not saying we serve them at all costs. But it is their money — they do contribute to our bottom line. So their satisfaction is of the utmost importance. With any project management undertaking, making sure that it gets off on the right foot is critical. You know the saying; “You only get one chance to make a good first impression.” Just as important is how you shut things down; the little – and big – things you do to make sure all of your bases are covered, the client is pleased with how things went and senior management views the outcome positively. The process of handing a project engagement from sales to project management is deﬁnitely one of my pet peeves. Many a project has started out on the wrong foot because the earliest – and very critical – high-level scoping phase of the project is often being performed by someone without any formal project management experience. The end result? A project customer who walks away happy that they will be getting ‘x’, a sales person who walks away happy because they sold ‘y’ for top dollar, and a project manager who is getting ‘z’ to deliver. strategy involved in the project. Available now - free! Click on the cover image - it will take you to the Project Smart site for your free download. "Dead on, Brad. Excellent book and I think most all of us have committed these regularly. Reading this will help us be better PMs on our next project and recognize these deadly sins in advance. Thanks!" Available now - free! Click on the cover image to the left to get your free copy. "I just downloaded it. It would be a valuable guidance for everyone who would learn more about project management. Thank you for sharing." "Thank you for sharing your lessons learned, knowledge and experiences - this is what true and real project managers demonstrate consistently." "This should be mandatory reading for government project managers." Available now - free! Click on the image to the left for a description and download link. "Brad, you nailed it in this book. Everyone responsible for running projects should read this eBook." "Project communication drives the project. This book is a must read. Keep these books coming Brad! Thank you!" successes on the projects we manage. As many as 74% of all projects prove to be failures to some degree or in someone’s opinion. What we can do is practice best practices, plan well, try to re-enact what worked in the past on similar projects, and avoid those things that we know caused us or our colleagues problems on similar implementations in recent memory. If we don’t learn lessons from our own actions and from the actions of others then we are likely to repeat the same mistakes over and over again and experience the same project failures over and over again. Offering a step-by-step project management life cycle practice, or adoptable project management methodology, if you will. Great for the consulting PM, the small startup organization, or the large IT shop that has yet to reach the point of repeatable, sound IT project management practices. My processes can be easily adopted to fit your non-IT project management needs as well. Should be available by mid 2015 as a PDF book for purchase through PayPal. Check back here and look for updates on Twitter @begeland. A real life working guide to project management. Covering everything from the project management lifecycle, the project management office (PMO), what makes PM work and what doesn't, lessons learned, PM consulting, etc. Lots of real world information, templates, examples, and advice from a professional with more than 19 years of project management experience and 25 years total in the information technology industry. Work in progress - so no date set as of now. Will be available as a PDF book for purchase through PayPal. Check back here and look for updates on Twitter @begeland.